Furthermore, Hannah doesn’t give up Samuel immediately. She actually waits until she weans Samuel, probably two or three years (1:26), before she takes him to Shiloh and leaves him there for Eli to raise. If I was going to give something big to the Lord, like my firstborn son, I’d try to do it as quickly and painlessly as possible, the way Abraham got up and obeyed when told to sacrifice Isaac. I wouldn’t keep my promise around and get attached to it. But this is exactly what Hannah does. Hannah knew that the earth is the Lord’s and everything in it (2:8; Psalm 24:1). I’m still working on that. However, I think I’m getting better at it. When the car needed repairs recently, I was able to say, “Lord, your car needs to be fixed, so we’re taking some of Your money out of Your savings account and investing Your money in the car You’re allowing us to use and care for.” It still seemed like a lot of money to spend on a car, but isn’t it always easier to spend someone else’s money? The final thought that challenges me is Hannah’s obedience to her vow. I wonder if I’d be tempted to keep such a tremendous miracle to myself. After many years of hoping to get pregnant, she follows through and gives her firstborn son to God, and this without any guarantee of having another child. I’d be tempted to hoard my miracle blessing to myself in fear of never getting another. Hannah did have five other children (2:21), but she didn’t know that when she took Samuel to Shiloh. For all she knew, this might have been the only child she would ever have. 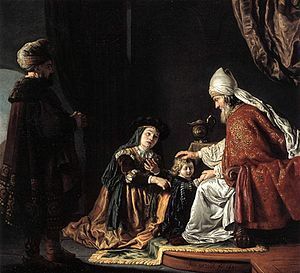 Still, she fulfills her vow to the Lord, who then accepts her gift and raises Samuel into one of the greatest leaders in Israel. The Lord is reminding me that everything I have is His and I don’t own anything. Not the physical things I have like my car, clothes or books, much less my writing, the church I pastor, the family I am part of or the country I live in. I don’t even possess the air I breathe, for I give back every breath I take. Everything in my life I will give back to God in the end. And as I come to understand this, it makes fulfilling my commitments to God much easier. I’m learning that since nothing I offer Him is truly mine in the first place, I don’t need to worry about ever having enough.